Czech Fitness President Chamber Jana Havrdová and EuropeActive Policy Officer Francesco Capuani focused on the European Week of Sport & National Fitness Days as key initiatives to encourage National associations to promote physical activity. Francesco Capuani said that “the fitness sector is a key partner of the European Commission in promoting physical activity and healthy lifestyles. With the National Fitness Day campaign we call on the fitness sector to open their doors, organise all sort of activities and welcome the general public during the European Week of Sport". UKActive’s CEO Steve Ward hosted a session to unveil key topics on how to work with your government to get more funding for promoting physical activity, highlighting that “ukactive’s work with the government and parliament is central to our the physical activity agenda and to translate it into real policy that can transform the health of the nation". Conn McCluskey, CEO at Ireland Active, and Portugal Activo Treasurer Ana Damaso provided valuable insights on why VAT rates on fitness club members are so variable and the possibilities to get a reduction. Pure Gym CEO Humphrey Cobbold and OC&C Strategy Consultants partner Alex Birch shared their knowledge on the role of intermediaries/aggregators and their impact on fitness sector by assuring that “the data gathering and analysis completed by OC&C clearly shows that the aggregators are coming to the fitness sector and that their arrival will be disruptive". DSSV President Birgit Schwarze took attendees through the importance of paying trainers according to their qualifications and skills, providing insights from the collective bargaining process in Germany: "We are a service industry and a service industry revolves around people. I think we should invest more in these people and their qualifications to further grow our sector". EuropeActive Policy Officer Elisabeth Thienemann and consultant Andrew Grant explored what the jobs of the future will be like and unveiled exclusive findings of our top trends and skills foresight, stressing that “the fitness sector needs to be prepared for future opportunities – and challenges. Changing demographics will impact client’s needs. The future fitness user will be older than today’s user and will have a higher risk to suffer from non-communicable diseases. Consequently, fitness professionals need to be skilled and specialised to work with these groups”. The morning concluded with EuropeActive’s Director of Professional Standard Committee Julian Berriman and Hungarian Health and Fitness Association President Dr. Laszlo Zopcsak reinforcing the relevance of national registers for EREPS: “The European Register of Exercise Professionals (EREPS) is a pan-European system, based on independent national registers and supporting European Commission principles of mutual recognition of qualifications and workforce mobility". The event culminated with a snapshot evaluation and the Networking Lunch where representatives had the chance to debate and exchange ideas. 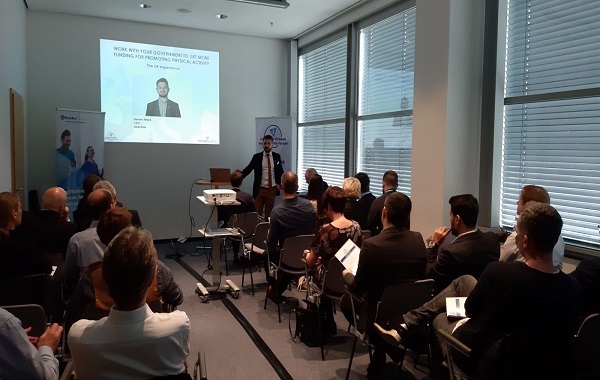 EuropeActive’s EU Policy Officer Lukas Declercq commented on the event, saying that “EuropeActive was delighted to celebrate EFAF for the first time and so to enhance the importance of National Associations’ work to develop and promote the fitness sector”.